Eating healthy doesn’t mean you can’t feed your sweet tooth, and these scrumptious coconut flour pancakes are the tantalizing proof! They’re ridiculously fluffy and SO easy to throw together — not to mention, they’re anything BUT dry! Choosing a rich, sweet breakfast option to fuel your day doesn’t have to mean that nutrition goes out the window. 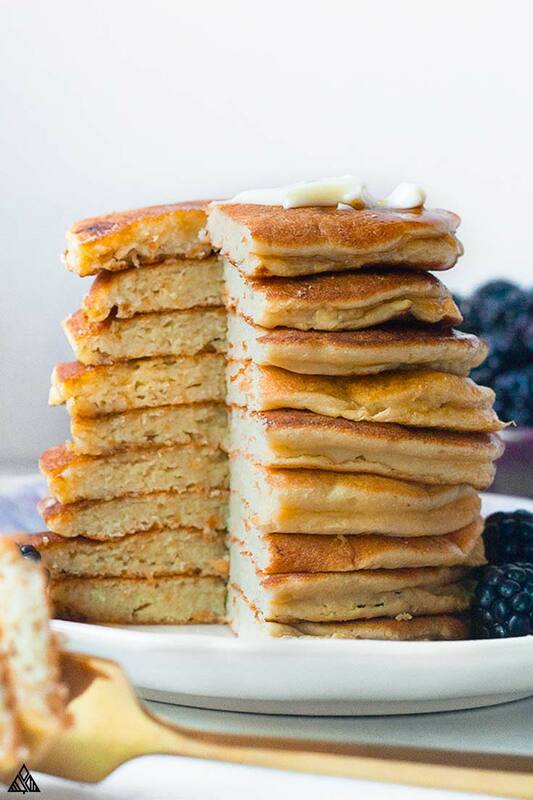 Whether you want to tempt your weekend palate with some incredible coconut flour banana pancakes, or you need a tasty treat to add into your low carb meal plan rotation, these perfect little pancakes rise high above the rest! Throwing together a batch of these light and fluffy coconut flour pancakes is practically effortless, but they sure won’t taste like it. Get rid of that bland box mix, grab your whisk and let’s whip up a sweet starter you’ll be proud to serve (or gobble up yourself)! You can use these pancakes as part of your low carb recipes, make aip coconut flour pancakes or easily adapt it to make no carb pancakes that taste as glorious as the ones your mom used to make on Sunday mornings. Remember how they made you feel warm and happy from the inside out? 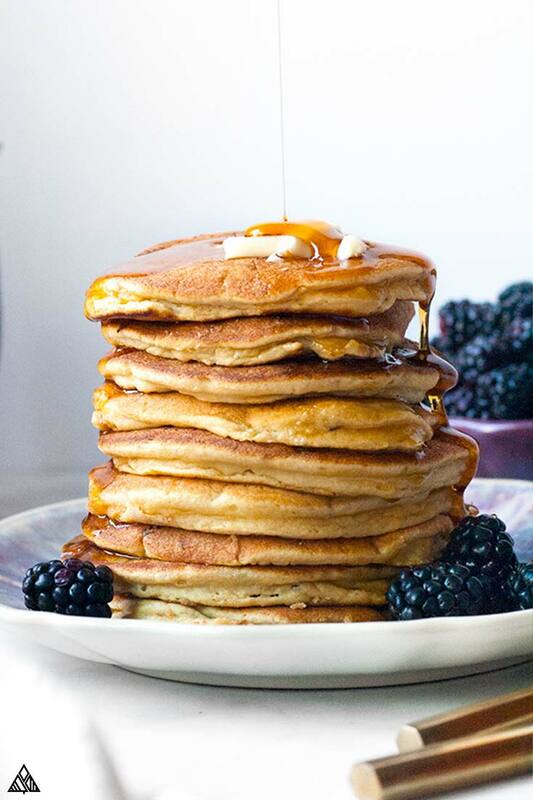 Toss all your coconut flour pancakes ingredients in the blender. Coconut flour tends to clump together when stored, because of its low moisture content. 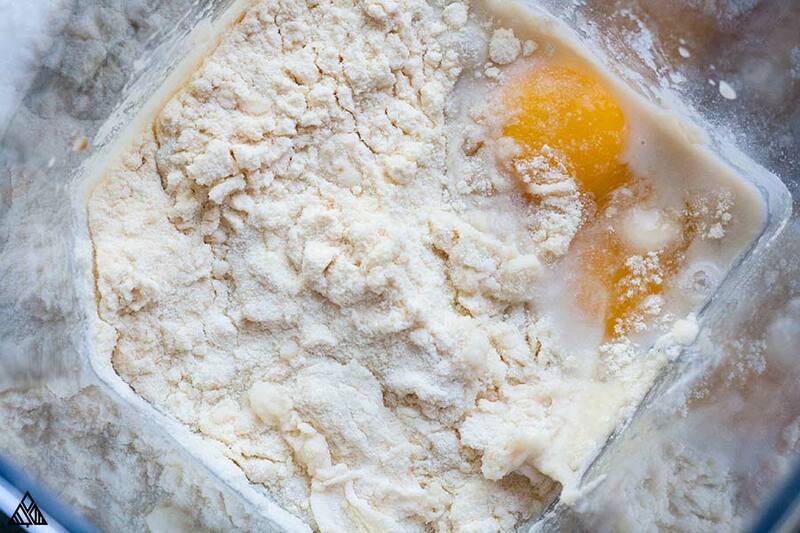 So, be sure to break apart any clumps before mixing in the other ingredients. The great thing about coconut flour is it’s a low carb flour, due to its high fiber content. Coconut flour is also a nut-free alternative, which is a huge benefit to those of you who suffer from allergies or sensitivities. You’ll also need to choose your sweetener before getting started. Using coconut sugar or other granulated sweeteners (brown sugar, table sugar, etc.) is fine, or you can opt for keto sweeteners like erythritol. 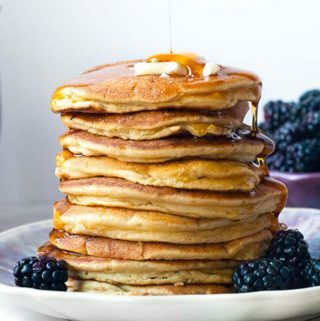 Erythritol is a diabetic friendly sugar alcohol that has 0 calories per serving and doesn’t upset the stomach — it’s my sweetener of choice for these coconut flour pancakes keto! My favorite thing about pancakes are the toppings — There are so many delicious options and flavor combinations to please the palate! Instead of just topping your coconut flour pancakes, try tossing some of the above ingredients in the batter for a warm, delightful treat that is sure to get you off to a delicious start! Tossing a handful of berries into this low carb pancake mix is just one easy way to enhance the flavor. Or, try making low carb cream cheese pancakes for a warm bite of sunshine that leaves you glowing! Using keto sweeteners, like Erythritol or Stevia, is an easy way to make low carb pancakes. A word to the wise, however. Steer clear of xylitol in this recipe because it tends to absorb moisture. Omitting the cinnamon in this recipe is another option that really enhances the vanilla nuances. You get a batter that’s just a tad richer instead of that sweet hint of cinnamon. The vanilla can totally stand on its own in this recipe. 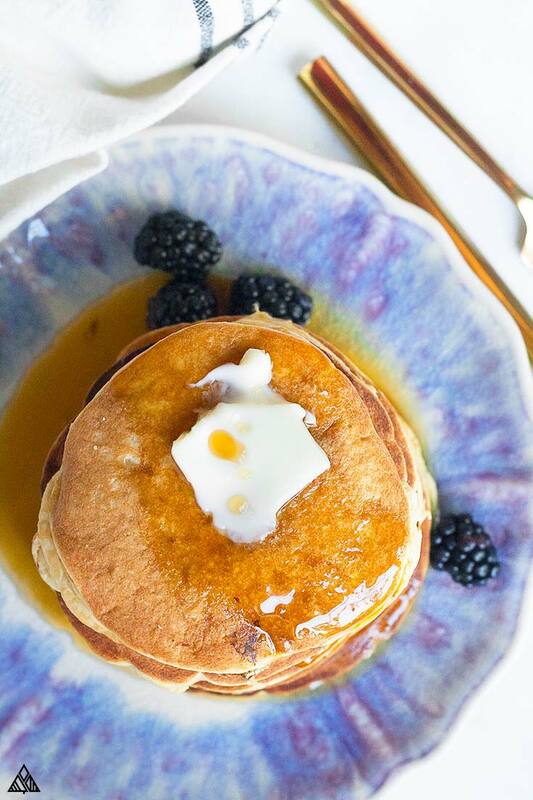 Make these coconut flour pancakes with milk or dairy free. I use low carb milk (which is also paleo/dairy free) — full fat coconut milk is my fave for this recipe. You can lighten up the dish by opting for light almond/coconut milk, or keep it about the same by using some heavy cream. The possibilities are endless. 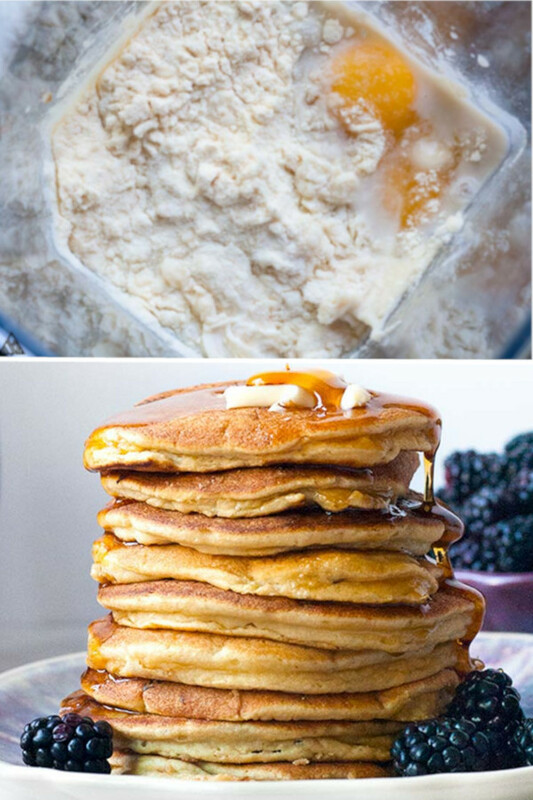 Whether you’re making coconut flour pancakes for one or using them as part of your low carb meal prep, this tantalizing breakfast is incredibly satisfying! Can You Turn These In to Almond Flour Pancakes? Working with coconut flour takes a little finesse. It’s very dry, which can leave many coconut flour recipes brittle, and they often falling apart. Which is why baking with coconut flour requires using additional moisture to get the desired consistency. It also has unique baking characteristics that prevent you from using it as a 1:1 swap with traditional wheat flour or other flours used to make low carb foods. If almond flour is your goal, I recommend using an almond flour pancakes recipe instead. What About Protein Powder Pancakes? Making protein powder pancakes is an activity that can be as simple or as complex as you like. It also requires a certain flair to get them just the way you want them. It’s best to use a protein powder pancakes recipe to ensure delicious success. Of course, pancakes are at their best when they are made fresh and served immediately. If you have a busy, bustling household, you can pre-make the batter for the gluten free pancakes and cook them in a warm skillet as tummies start rumbling. It never takes long once that sweet aroma fills the air! You can also make these coconut flour pancakes ahead of time and freeze them. Just toss them in the microwave to warm them up. Coconut flour pancakes are delightful and whimsical any day of the week. I know your tummy is rumbling and your mouth is watering, so I’ll let you get started cooking now! Be sure and post in the comments below. Let me know your favorite variation. I still have pancakes for dinner one day a week, ha! How about you? Delicious, soul satisfying Coconut Flour Pancakes that are moist, fluffy & topped with sautéed peaches. They taste great and they're actually good for you!! Add ingredients to a blender in the order listed above and blend until combined. You may need to stop the blender to scrape the ingredients off the sides (using a rubber spatula) to ensure everything combines thoroughly. Heat a nonstick over medium heat and add coconut oil. Wait until the pan is warm, then pour the batter into the pan, forming round pancakes**. Cook the pancakes for about 3-4 minutes on each side, or until they have a nice golden sear. Set cooked pancakes aside while you continue to cook the rest. Serve warm topped with your favorites (suggestions above) and enjoy! Nutritional information is based on 2 pancakes, if you divide this recipe into 16 medium pancakes. *I prefer erythritol, which is a sugar alcohol, and a great low carb sweetener. If you aren’t keto/low carb, swap this with any granular sweetener. **For prettier pancakes, use a griddle, or pour your batter 1 at a time into the center of your pan. Hi Sophie, It makes 14 2-3 inch pancakes. Thanks!